We have bungalows of different sizes and styles as well as open dormatories. Low Season = 01.03. - 10.04., 19.04. - 30.11. High Season = 01.12. - 21.12., 03.01. - 31.01., 12.02. - 28.02., 11.04. - 18.04. Special Holiday = 22.12. - 02.01., 01.02. - 11.02. We have bungalows with en-suite private bathrooms and balcony. 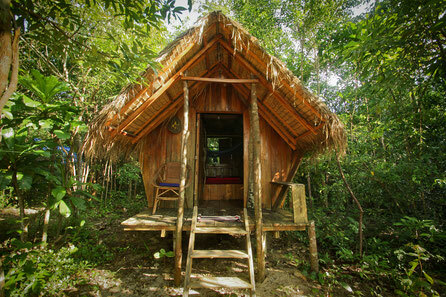 Secluded and private, surrounded by nature, and without immediate neighbors. 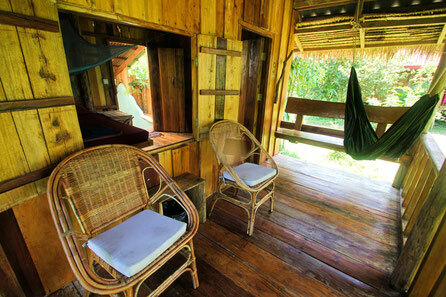 The wooden bungalows are built in Khmer style and have solar powered lights. Bathrooms are equipped with Western toilets and Khmer style bucket showers. Electronic devices can be charged during day time in the restaurant. 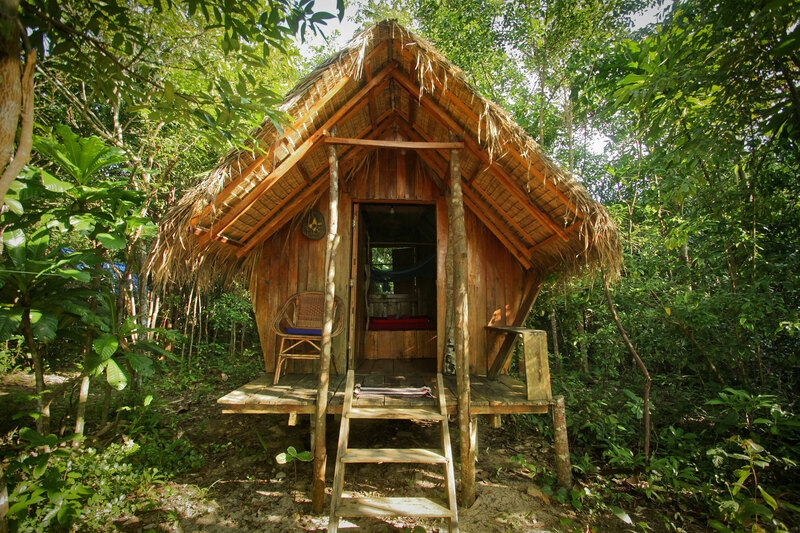 Small wooden bungalows built in an organic style. Each Bird's Nest has a double bed with mosquito net and a front porch where you can chill-out and enjoy the tropical ambiance. Bird's Nests are surrounded by trees, yet only 50 meters to the ocean. Lights in the Bird's Nests are powered by solar energy. Electronic devices can be charged during day time in the restaurant. Shared community bathroom: Western toilets and Khmer style bucket showers. 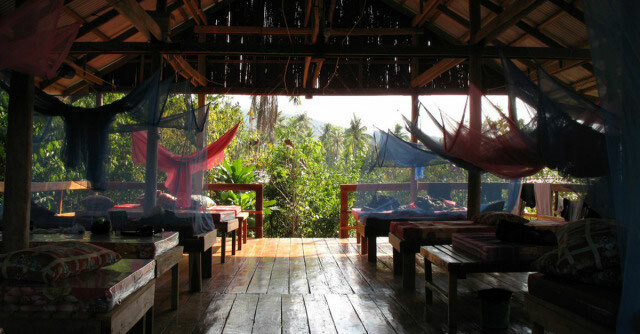 Khmer style, open dormitory on piles set in the jungle. For single travellers or groups. 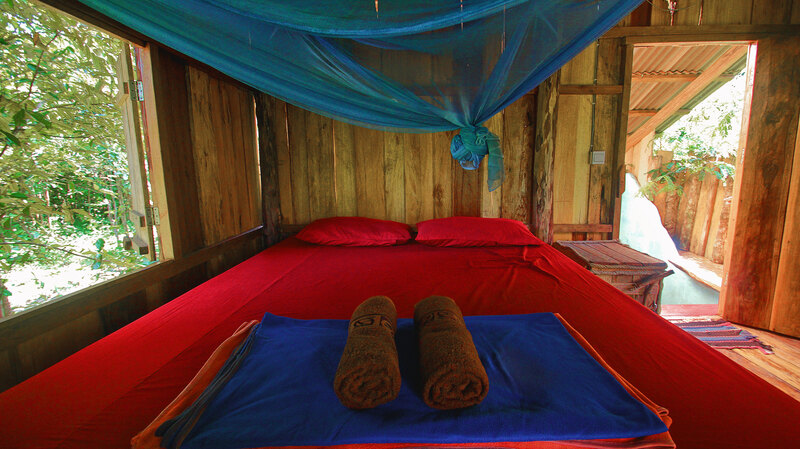 Each bed has a mosquito net and there are shared bathrooms. You'll fall asleep and wake up to the sounds of the forest.